Gain That Golden Bronze Look with a Fun Spray Tan System! Quick, easy and effective... The ultimate in spray tanning systems, the Mini Tan M-Model 2100Mini Spray Tan System from Fuji Spray and Family Leisure pairs portable convenience with modern commercial precision. 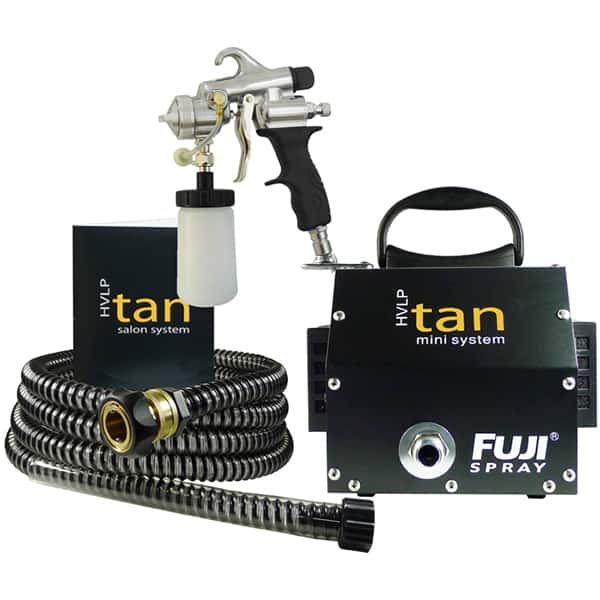 This spray tan system is designed for use as a cosmetic device in a tanning salon; as a professional-quality piece of spray tan equipment this model comes with several special features. The motor speed is automatically set (no changing speeds or adjustments while in use), the black 10-foot hose offers a quick-connect brass connector to the spray gun, the insulated handle never gets hot and so much more (see a full list of features below). Quality is promised with this manufacturer. The M-Model spray gun is the best on the market with a non-bleed trigger valve that reduces dust blowing while you or your customers are gaining that golden hue. So start tanning without sitting on a beach or in a tanning bed for hours with the Mini Tan M-Model 2100Mini Spray Tan System from Family Leisure. Bottom Feed Cup - Capacity: 8 Oz. Mini Turbine Dimensions: 11" x 8.6" x 8.1" - 14.4 Lbs. Use gun to blow-dry client. Gently pull the trigger and only air will come out. The spray pattern is a fan pattern that will spray a four-inch fan when the gun is six inches away from the skin. The manufacturer considers this the ideal size fan for spray tanning. For a smaller fan just move the gun closer or adjust the knob on the M-Model. You can manually adjust the setting into a round pattern - this smaller setting at 1/8-inch diameter is perfect for adding abdominal shadows. Dimensions 11" x 8.6" x 8.1"